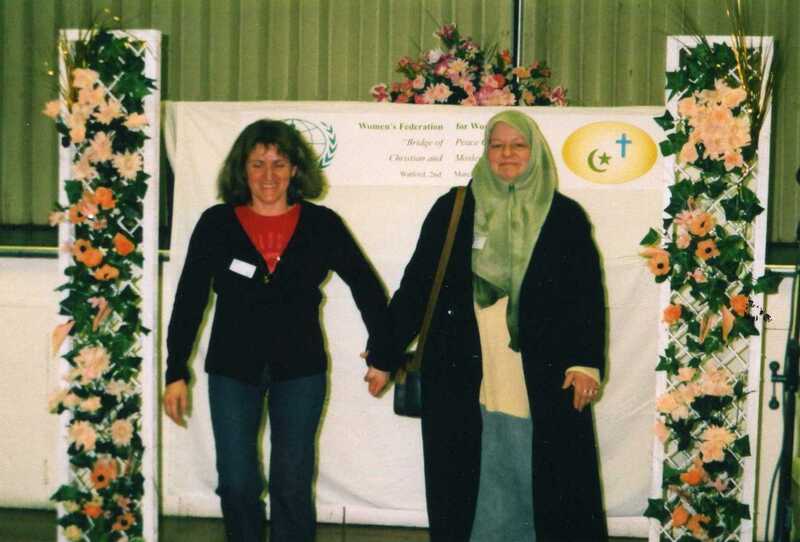 At the break of the Iraqi war, on March the 2nd 2003, the Wom­en's Federation for World Peace with the help of the Watford Interfaith Association hosted a Bridge of Peace Ceremony at the Multi Cultural Community Centre in Watford. Women from the Christian and Muslim community were invited to partic­ipate in a Bridge of Peace Ceremony to express their commit­ment to peace and reconciliation. Forty women from both communities crossed a symbolic Bridge decorated with flowers and became sisters of Peace. It was a very moving moment when the Christian and Muslim la­dies embraced each other and recited together the pledge of sisterhood. The Mayor of Watford was present and congratu­lated the ladies for their commitment for peace and reconcili­ation. After the cere­mony and some refreshments, the partici­pants shared with their newly found sisters. Addresses were exchanged and promises to keep in contact and learn more about each other's faith and cul­ture. We ended the afternoon with dances representing the Jew­ish, Christian and Muslim faith. There was an amazing atmosphere of celebration and joy. Bridge of Peace Ceremony for Friendship and Co-operation. Through the Sisterhood Ceremony, I join in friendship with my partner to build A bridge of Peace and reconciliation between our communities. As a woman concerned with peace at all levels of human endeavour, I will strive to be a peacemaker and harmoniser in my family, Community, society and between nations. We organised several other sisterhood ceremonies inviting women from various backgrounds to join us and we held several community events e.g. fun days and fundraising events for charities, we visited Mosque and church. See Sisterhood page Click here. We held talks on various topics regarding women and family issues Click here. In 2007 we were selected to receive the Pathfinder Fund for the Prevent program from the Home Office.